Perhaps part of growing up is coming to terms with the fact that beef — while potentially culturally exciting — can be bad for business. Artists like the now virtually disenfranchised Ja Rule learned that the hard way when beef left his credibility on life support. 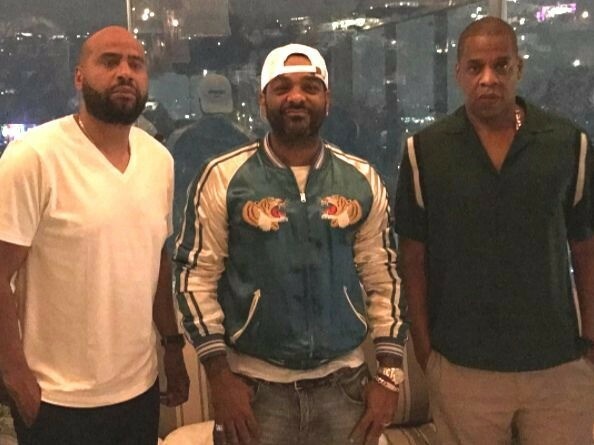 For this reason, we’ve seen many squabbling artists reconcile over the past decade, including The Game and 50 Cent, and of course, Jay Z and Dipset Capo Jim Jones. On Tuesday (June 6), Jones posted a photo of Jay Z and him together, further proof their 13-year feud has ended. Jones, who recently signed to Roc Nation to the surprise of many, hadn’t met with Jay Z — at least publicly — face-to-face. They have yet to announce any music formally, but it’s naive to think there isn’t already some heat on deck. Their history runs deep. Bad blood between the Vamp Life rapper and the one-time Jaz-O protege began to boil back in the Roc-a-Fella days — and Dipset’s position within the fold. During Red Bull Music Academy’s Five Out of Five Tour, Cam’ron revealed there was a Jay Z remix of the smash hit “Oh Boy” left on the cutting room floor, much to Jigga’s frustration. It was during this period the obvious tension began to swell. A few years later, after the label’s ultimate demise and split, Cam unleashed a tirade against Jay, which went largely ignored by the (then) Def Jam president, though he did take a public shot at Jones in a 2006 statement. For the better part of the decade that followed, there were subliminal shots — and not so subliminal shots. Like Jay’s flip of the hit record “Ballin’,” where he took some mediocre shots at Jones, and Cam and Jones’ Funkmaster Flex “Victory” freestyle, in which they lobbed some jabs at their former boss. But that was then and this is now. In comparison to the friction between Jones and Max B — and the more disappointing falling out between Jones and Cam — the Jay-Z “beef” seems kind of insignificant, and appears to be water under the bridge. Two questions remain — is a collaboration in the works and will Jones have any involvement in 4:44? We’ll have to wait and see.